Employing a features-on-demand licensing strategy has significant advantages for developers as well as end users. In many instances, the full capabilities of a particular software program are rarely utilized, or perhaps an end user doesn’t need them initially but may grow into them over time. In this case, a features-on-demand model makes perfect sense. The end user makes an initial investment of just those capabilities that are needed at the time of purchase. Later, additional software features can be enabled through a simple software key activation without requiring any hardware changes since the features already exist in the device and need only to be unlocked. For developers, a features-on-demand business model enables them to lower the upfront investment required by their customers, and thus remove a significant barrier to entry for new customers who previously may not have had the purchasing power to invest in the system. Plus, the system can be easily upgraded with new features as needed, with very little effort required by the developer. For example, consider the case of Fritz Stephan, a global developer of highly specialized technical solutions in ventilation, anesthesiology and oxygen supply. Fritz Stephan’s EVE ventilation systems were developed for a very sensitive group of patients that require gentle and non-invasive ventilation therapy. The ventilation family consists of three models: EVETR is mainly used in emergencies and during transport; EVEIN is a fully-fledged intensive care respirator for patients in the hospital environment; and EVENEO is an intensive care ventilator for the neonatal unit. In this case, they integrated Wibu-Systems’ CodeMeter technology, that not only addressed their licensing objectives, but also provided a security solution that protected their Intellectual Property from theft and their systems from tampering. With CodeMeter, they structured a scalable licensing model where they can remotely activate features on-demand. This allows them to create new post-sales revenues and deliver responsive pricing models for their customers. Essentially, the device that was initially purchased by the customer stays the same, but it can be upgraded in the field, no matter where it was sold. With EVENEO, the adult features can be easily enabled at a later stage, or the neonatal mode can be activated for EVEIN at any time. Furthermore, with CodeMeter, Fritz Stephan was able to implement security mechanisms for the safety of the patient. To ensure the integrity of the devices, CodeMeter Embedded, a modular environment for embedded systems, was integrated into the software and a unique CodeMeter SD card (CmCard/SD) was built directly into each EVE device. The card holds the encryption keys along with digital signatures, certificates, and entitlement rights securely in a smart card chip. The operator of the ventilation device cannot access this card without physically tampering with the machine, while the maintenance or sales personnel of Fritz Stephan can easily replace them. This is just one example of where a flexible licensing and protection system can greatly improve the bottom line for developers and satisfaction levels for customers. You can read the full case study of Fritz Stephan and CodeMeter here. 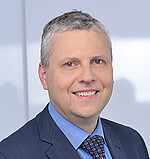 After studying computer science at the Karlsruhe Institute of Technology, he worked in traffic simulation R&D before switching over to IT project management and key account management for large ICT companies. Since 2012, he is active in the Kay Account Division of our Wibu-Systems sales force.